"This is a refreshing change from the baby food preparation that too frequently befalls the hapless squash. It makes an impressive dish when sliced into wedges and surrounded by roasted veggies." Cook and stir bacon in a large skillet over medium-high heat until evenly browned, about 10 minutes. Use a slotted spoon to remove bacon and discard most of the drippings, leaving about 2 teaspoons bacon drippings in the skillet. Drain bacon on paper towels. Cook and stir onion in the hot drippings until translucent, about 5 minutes. Stir cooked bacon, dates, oregano, and basil into onion; add chicken stock to thin the filling. Cut the top and stem from the squash, jack o'lantern-style, and scoop out seeds and stringy pulp. Cut out and discard small button at the bottom of the squash. Stuff the date filling into the cavity and replace the top. 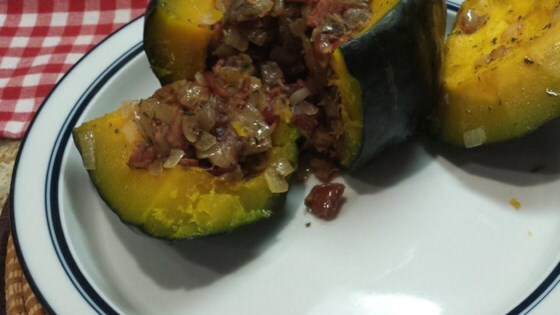 Set squash into a baking dish, pour in 1/2 inch of water, and cover with aluminum foil. Bake in the preheated oven until squash is tender, 40 minutes to 1 hour. Test for doneness by removing top and inserting a thin, sharp knife into the flesh at the bottom. Slice squash into wedges to serve. See how to make summer squash stuffed with sausage and goat cheese. These measurements are for a small squash. Pick a squash that has a flat-enough bottom to sit upright in the pan during baking. EAT THE SKIN, it's eminently edible and good for you. If you need more, consider using multiple small squash as they are a little more tender and easier to manage. Loved this!Only change, I used fresh herbs, otherwise this was fantastic! Will make again! Made as written. I used a blender to chop dates and bacon together. Excellent recipe! butternut squash... acorn squash... doesn't matter. I would add some rice to it though, or potato. But, nice flavor!